Seven tips on how human resources and the marketing department can collaborate to create bigger profits for your company. Mitch Hershkowitz never thought he would see the day when HR and marketing teamed up to drive higher profits. But that day came in 2009. Dimension Data, where he is National Practice Manager, Consulting Services, was under pressure to standardize on a single internal instant messaging platform to eliminate employee silos–a daunting task for a global company with over 14,000 employees. 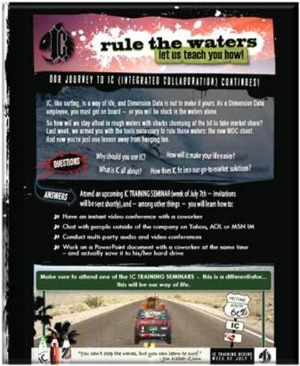 Marketing’s clever “Rule the Waters” boogie boarding and beach-themed internal campaign for the new system triggered a tsunami of support. Why should HR care about marketing in today’s wired economy? Because a holistic marketing approach that crosses departmental boundaries leads to greater brand repute, predictable growth, and market value. In the past,the marketing department was actually in control of their brand and collateral, and B2B marketing was primarily a “push” activity replete with fancy corporate presentations, outbound marketing, and direct selling. Social media and the erosion of command and control cultures has changed that model forever. John Robak, EVP and COO of Greeley and Hansen LLC in Chicago, leads the HR-marketing marriage trend. Greeley and Hansen is a mid-sized civil engineering company with about 300 employees across 18 geographic locations and help clients handle complex water and wastewater issues. Robak’s deep HR background is unusual to find in the executive suite, particularly among mid-sized B2B firms. –Author Lisa Nirell helps companies grow customer mind share and market share. Since 1983, Lisa has worked with Sony, Wells Fargo Advisors, Adobe, Microsoft, and hundreds of entrepreneurs in nine countries. Lisa is also an award-winning expert speaker and author of EnergizeGrowth® NOW: The Marketing Guide to a Wealthy Company. Download your sample chapter and business energy booster survey at energizegrowth.com.